Let me be clear about one hard and fast rule I have: I dislike web sites with black backgrounds and white letters. They have been proven time and time again to be difficult to read. 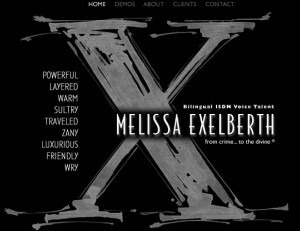 I think Melissa Exelberth’s voice-over web site design is outstanding. So much for my rules. I think as a voice-over web site what stands out to me most, I what I know from personal conversations with the lady her own self, is the “X”. It just grabs your attention and makes you stop and look at the site. And as always, a simple, easy to follow layout helps you find everything you need from crime to the devine! Yes Doug is a long-time friend of mine but that’s not why he’s leading off this series. In fact, he doesn’t know I’m writing about his web site. Well, I suppose he does now. But look at that one picture of his web site and see if you can’t pretty much find out everything you need to know about Doug and his amazing voice-over work in about 3 seconds. 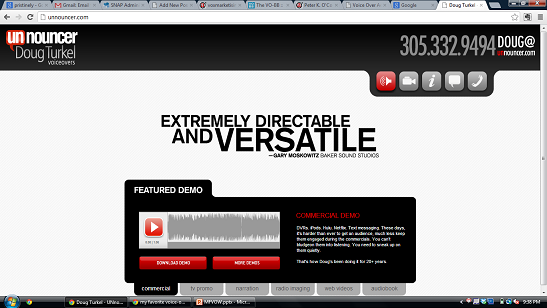 Want an easily accessible demo? Check! Need a killer testimonial (or six)? Check! Branding upfront? Done (well done)! Got a phone number you can link to if you’re on a cell? Got it! What is also annoying about Doug is that this is the SECOND amazing web design he’s pulled off. I don’t have a picture of his old site which was done in a brilliant, extreme close-up, comic book design; it really was terrific. Point of fact, though: he outright stole from me the red, black, gray and white color motif…as did every other web site that uses the red, black, gray and white color motif. Rat bastards, all of y’all. It was actually this redesign that made me realize that my old site design (which I still arrogantly love) did need to be brought up to speed with the changing technological world we live in. Doug cost me alot of money. 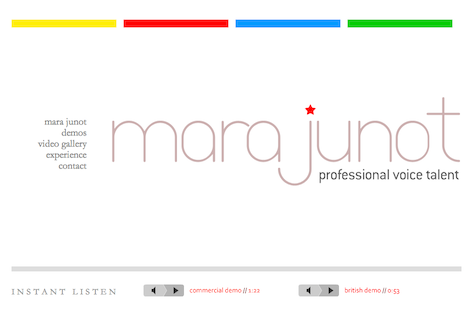 Look at the use of fonts on this site…spectacular and the buttons are awesome. It’s causing me, upon further reflection, to think about tweaking my site on one small item. So Doug will cost me even more money. Upon even further reflection, you should only look at this site for ideas if you have enough money in the bank. You’ll have to excuse me now as I have to go sell one of my kidneys on ebay. The other day when I was writing my FaffCon thank you blog post, I tried to take a look at every voice-over web site that I linked to. Some had no web sites (didn’t need them I guess, no rule says you HAVE to have one) some had what I would consider an OK web site and some had web sites that really caught my eye, that I thought really conveyed the brand well. These sites were unique in design and that just clicked with me. 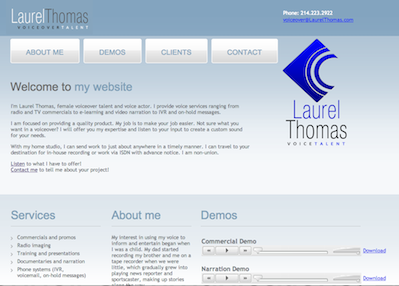 It got me to thinking that there are more than a few voice-over web sites that I’ve always admired for different reasons. So what I thought what I’d do is occasional blog feature one here that maybe would give you an idea or two for your web site (not that anyone in voice-over has ever stolen a web idea or three from a peer) and just generally give you an appreciation for some good design. Let’s be clear…I don’t need help, I don’t nominations and if you beg, you’re banished. When I find them and I like them, I’ll write about them. It may take me a long time to find yours or your design may not click with me. That makes neither you or me a bad person…well I may be a bad person but that has nothing to do with this series. Remember also, good design does not always translate into good Search Engine Optimization, which is really where the game is played. Somebody may have a dog ugly web site which is pristinely optimized and somebody else might have an amazing design that search engines ignore. Not for the first time in my life, I’d go ugly. So with all that out of the way, I hope you enjoy the occasional peeks into voice-over web site greatness (in my opinion).